My dear friend Just had a baby girl, I made this album for her. This is the altered art album I made for my friend Dana. 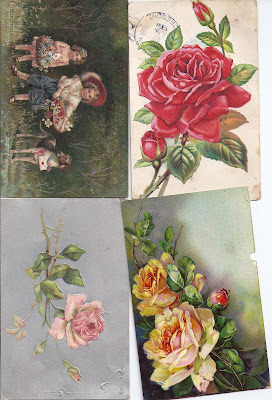 She loves roses, I made pockets, photo mats and tags. She loves Winnie the Po. Close up of some of the pages. More pockets tags, behind the embossed page on the right side is a tablet to journal on. Used vintage wallpaper for the photo mat on the right side. Pocket made from dyed lace and decorated with a hand crafted flower and lace from an upcycled wedding dress. I have heard a saying in the last couple of years, " put a bird on it", and it seems like that is the thing to do. 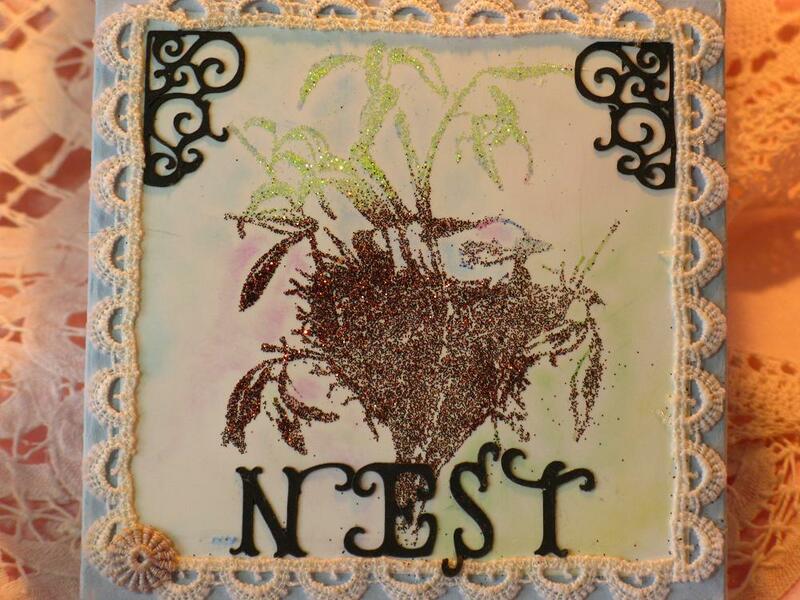 Why do we love birds and their beautiful nests so much that we imitate them in our art. 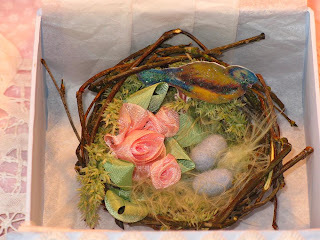 This is a nest I made from twigs from my birch tree with grass and found feathers, I made the flowers from ribbon and felted the little blue eggs, the bird was a free image that I added glitter to. I made several and gave some as gifts. These birdies are appliqued on a pillow, I love applique, and hand sewing. I also like the purple and yellow color combo, they are the complimentary colors on the color wheel. I got this paper at Michale's it was note paper and was all black and white, I colored the birdie with colored pencils and used it in one of my fabric journals as a ephemera page. What is in the box well I think you can guess from the birds nest on the lid. 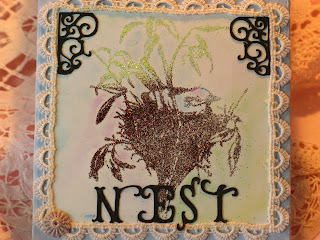 This one was stamped and embossed and inside is another of the nests I made form the twigs from the birch tree. 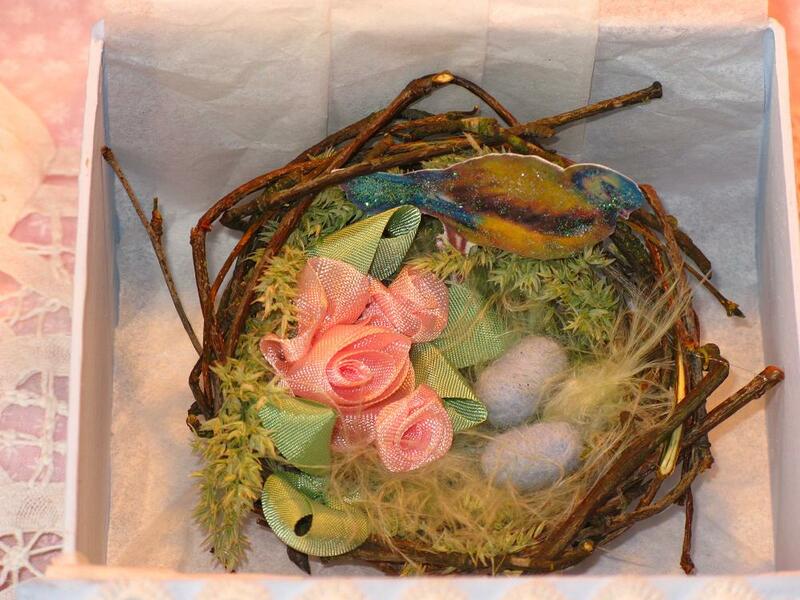 Well there you have it birds and their nests, they are beautiful in nature and in our art. Crafted from a collage of vintage lace and linens, With a Marie style shoe stamped on pink satin for the focal point on the cover. The beautiful cream bow is silk ribbon. The tiny flowers and leaves are made by me from silk ribbon, the larger pink flowers is from the rayon seam binding. 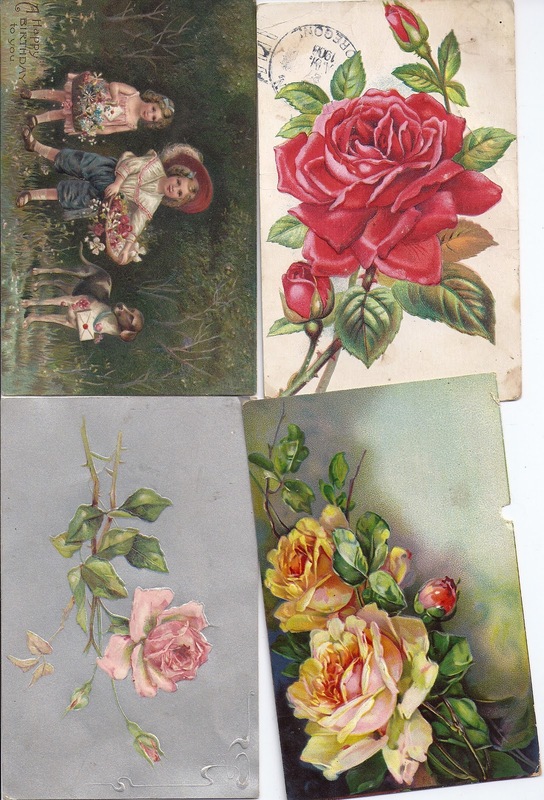 An inside look at the many ephemera pages, you can journal on these add photos, add your art and keepsakes. A close up of the inside cover, a french style stamp on pink satin, and the first page is a vintage embroidery transfer. It measure 6 inches by 5 inches. I made these flowers from velvet and netting and organdy, with rhinestone buttons for centers. We were to use winter colors, I chose red, rose and gold, we only had to make 5 for the swap but I made several in other colors for my art work. This mini pouch is one of the 2 I made with the kit my generous partner Bobbi Ann sent me. I made the flowers with some of the material she sent. The back ground material was so pretty in pink gold and blue and it set the color pallet. Pouch number 2, the lavender and purple flowers were included in the kit and went perfectly with the fabric for the pouch. The gold material is a pocket and I added the Paris label. It was fun putting together the pouches from the material Bobbi sent.